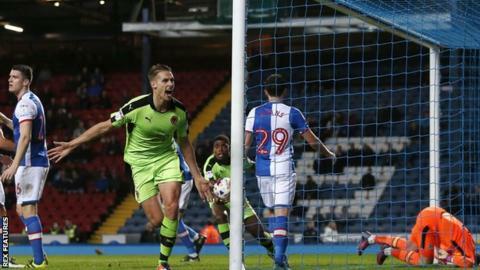 Championship strugglers Blackburn drew with managerless Wolves in a game marked by protests by home supporters. Rovers fans showed their opposition to Indian owners Venky's by not taking their seats until the 18th minute and then walking out in the 75th minute. Sam Gallagher's superb early volley put Blackburn ahead at the break. Dave Edwards headed in Matt Doherty's cross to level but Wolves, who sacked Walter Zenga on Tuesday, are now without a win in their last six games. Blackburn fans held a protest outside the ground before kick-off, while the timing of their late entry and early departure reflected the date of the club's founding in 1875. Several banners criticising the club's owners were visible in the sparsely-populated stands at Ewood Park throughout the match. After falling behind the visitors, with caretaker boss Rob Edwards in the dugout amid reports Nigel Pearson has been interviewed to replace Zenga, looked bright and could have levelled through Edwards or Conor Coady before the break. Substitute goalkeeper Andy Lonergan denied Rovers striker Gallagher a second goal just after the hour mark and the hosts may have complaints about the equaliser, with Doherty narrowly offside when he picked up the ball after Blackburn keeper Jason Steele palmed away Joao Teixeira's shot. Victory would have lifted Rovers out of the relegation zone, but they are now 23rd, while Wolves are three points above the bottom three in 17th. Match ends, Blackburn Rovers 1, Wolverhampton Wanderers 1. Second Half ends, Blackburn Rovers 1, Wolverhampton Wanderers 1. Attempt missed. Matt Doherty (Wolverhampton Wanderers) right footed shot from the centre of the box is close, but misses to the right. Assisted by Ivan Cavaleiro. Attempt missed. Danny Guthrie (Blackburn Rovers) right footed shot from outside the box is too high. Assisted by Ben Marshall. Attempt missed. Stephen Hendrie (Blackburn Rovers) right footed shot from outside the box is close, but misses to the left. Assisted by Anthony Stokes. Attempt missed. Sam Gallagher (Blackburn Rovers) right footed shot from the right side of the six yard box is high and wide to the right. Assisted by Anthony Stokes with a cross. Attempt missed. João Teixeira (Wolverhampton Wanderers) right footed shot from outside the box misses to the left following a corner. Corner, Wolverhampton Wanderers. Conceded by Stephen Hendrie. Corner, Wolverhampton Wanderers. Conceded by Jason Lowe. Corner, Blackburn Rovers. Conceded by Kortney Hause. Corner, Blackburn Rovers. Conceded by Danny Batth. Attempt saved. Craig Conway (Blackburn Rovers) right footed shot from outside the box is saved in the bottom left corner. Assisted by Ben Marshall. Attempt missed. Matt Doherty (Wolverhampton Wanderers) left footed shot from outside the box is too high following a corner. Corner, Wolverhampton Wanderers. Conceded by Jason Steele. Attempt saved. Ivan Cavaleiro (Wolverhampton Wanderers) right footed shot from outside the box is saved in the top right corner. Assisted by Conor Coady. Substitution, Blackburn Rovers. Anthony Stokes replaces Marvin Emnes. Goal! Blackburn Rovers 1, Wolverhampton Wanderers 1. David Edwards (Wolverhampton Wanderers) header from very close range to the bottom left corner. Assisted by Matt Doherty with a cross. Attempt saved. João Teixeira (Wolverhampton Wanderers) left footed shot from outside the box is saved in the bottom right corner. Assisted by Hélder Costa. Attempt missed. João Teixeira (Wolverhampton Wanderers) right footed shot from outside the box is high and wide to the left from a direct free kick. Attempt missed. David Edwards (Wolverhampton Wanderers) header from the left side of the six yard box is high and wide to the left. Assisted by Hélder Costa with a cross. Substitution, Blackburn Rovers. Stephen Hendrie replaces Charlie Mulgrew because of an injury. Delay in match Charlie Mulgrew (Blackburn Rovers) because of an injury. João Teixeira (Wolverhampton Wanderers) is shown the yellow card. Foul by João Teixeira (Wolverhampton Wanderers). Attempt missed. Gordon Greer (Blackburn Rovers) header from the right side of the six yard box is close, but misses to the right. Assisted by Craig Conway with a cross following a corner. Substitution, Wolverhampton Wanderers. Ivan Cavaleiro replaces Jed Wallace. Attempt saved. Sam Gallagher (Blackburn Rovers) right footed shot from the centre of the box is saved in the centre of the goal. Assisted by Marvin Emnes. Offside, Blackburn Rovers. Charlie Mulgrew tries a through ball, but Craig Conway is caught offside. Attempt blocked. Darragh Lenihan (Blackburn Rovers) left footed shot from the centre of the box is blocked. Assisted by Sam Gallagher with a headed pass.